I think I’m a pretty good judge of character. But then we all do, don’t we? I make up my mind about people swiftly. I have opinion-forming down to a fine art, and can make a firm judgment call with very little background information. First impressions are my jam. It looks silly written down, but you know what I’m talking about. There’s a “way” about someone that determines whether or not you like them immediately. Whether or not they’re your type of person. First impressions often feel like lasting impressions. However, I hope that you, like me, have found yourself proven wrong on occasion. 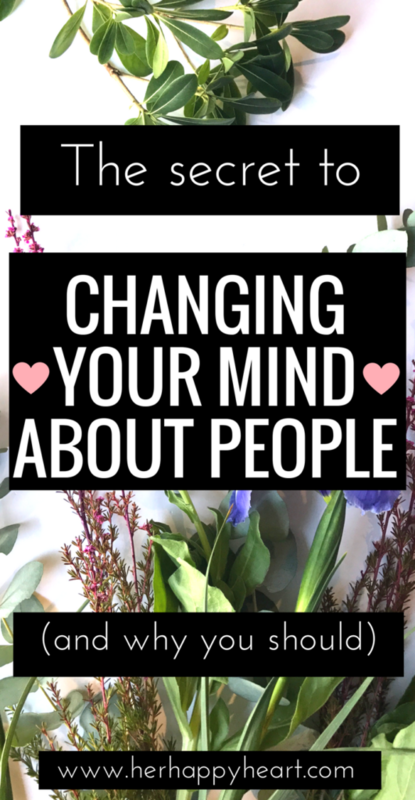 I hope that you have discovered the joy of changing your mind about a person, and stumbling into an unexpected friendship. Realizing that you have come to genuinely like someone whom you were determined not to is a beautiful thing. I once had a friend confess that when she met me, she thought I was superficially friendly and had no real depth to my personality. I remembered thinking that when I met her, she seemed stand-offish and desperate to leave our conversation. Yet somehow walls were torn down, bridges were built, and a friendship was formed despite our poor first impressions. So perhaps none of us has an exemplary record when it comes to first impressions. Just think of the relationships in your life that could have been discarded if those people had left a less-than-exemplary first impression on you. If that person had been wearing something you didn’t like. If she had said something you fundamentally disagree with. If he barracked for the wrong sports team. Think of all the moments, the candid photos, the meme tagging opportunities, the deep conversations and the laughs you would have missed out on, had you been determined not to get past those things. I’ll be the first to agree that not every person on earth is designed to get along. There’s nothing wrong with that. We’re dynamic, unique individuals and it’s important to accept that. But I think most of us would be surprised by how much more we like someone, the more impressions they get to make on us after that awkward first. Sometimes we form our first impressions of people before we ever even meet them. By the time we get a chance for a face-to-face, the damage is beyond done. They don’t have a living hope of impressing us. The problem with background information is that it’s all second-hand. All of it. Even the information that has been passed onto you from a trusted source (eg your BFF) has serious potential to be exaggerated, inaccurate or even a downright lie! Remember those fake rumours that used to circulate through your high school every time the nasty girl got bored? Those still happen, and they’re harder to pick up on than the far-fetched school-girl rumours you began to discern better as you got older. Clean the slate, squash that questionable information down, and say hi. I once befriended someone who was extremely unpopular in a particular group of my friends, and it was beyond rewarding. In fact, my friendship with her grew far stronger than the friendship I had with those who didn’t like her. Go figure. Sometimes people are wrong. Or their type of people and your type of people aren’t necessarily the exact same type of people. So disregard the opinions of other people, and make up your own mind. Have you ever expressed yourself poorly and found yourself mortified and kicking yourself later on, when it was too late to go back and correct it? It might not surprise you to know that we all do it. Unfortunately when it happens the first time we meet someone, a situation that already lends itself to awkwardness, a small gaffe can become an insurmountable wedge. Sure, maybe that person really is a jerk. Or maybe his brain didn’t call on the right words, and he skewed his point by a couple of marks. Maybe that awkward joke he made wasn’t because he found it funny, but because he thought you might find it funny, and he was flailing for conversation points. You won’t know unless you give him a chance to redeem himself. Nobody likes to be proven wrong about something, often even in a situation that benefits them (ie making a new friend). It’s a bitter pill to swallow, but acknowledging to yourself that actually, this person is better than you gave them credit for is super healthy. If you find yourself inadvertently warming to someone you had previously written off, embrace that feeling! There’s no need to be resolute for the sake of it, yet surprisingly, we feel we have to be. Tread carefully if you’re not sure if they can be trusted yet, but begin to let your guard down enough to see beyond your first impression. 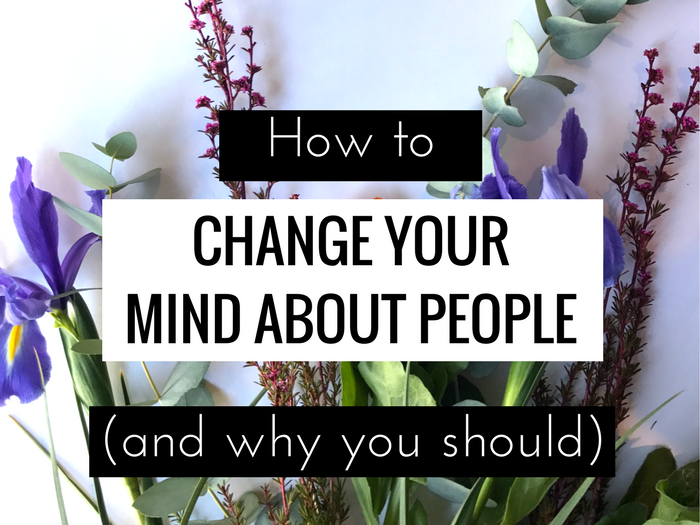 Free up some mental space (because disliking someone actually takes up a lot of it!) and give them another chance. The human condition is such that changing our minds, in general, just isn’t something that comes naturally to us. Our opinions are hard-wired and deep-seated. And when it comes to standing firm on our dislike of pineapple on pizza, it’s pretty harmless. But when it comes to resolutely disliking someone based on a first impression, our opinions only serve to harm us. So be encouraged to open your mind more often and give people another go. You might be pleasantly surprised! If this has challenged you, consider sharing it to Facebook (and challenging your friends!) via the link at the bottom of this post. Thank you! And for more life lessons and tips for self improvement, why don’t you follow my new “life lessons and self improvement” board on Pinterest? It is interesting Klara, because as a parent, the school rumour mill works the same. But it is all about ‘this’ or ‘that’ teacher. I have found the best strategy is to try and clear my head of all of that, and see how my child interacts with each teacher. A hard but good thing to remember, thanks for this post.